Broccoli is dirt cheap right now. Nothing is ever dirt cheap in Denmark, so the idea of buying a pound of broccoli for less than $1 is all sorts of of novel. Broccoli isn’t a staple in my kitchen. I’ve basically got three broccoli recipes… general tso’s tofu, stuffed broccoli bread, and broccoli-cheese quiche, so I consulted Pinterest where I learned that most broccoli recipes are for the most part either one degree removed from rabbit food, or a heart attack waiting to happen. 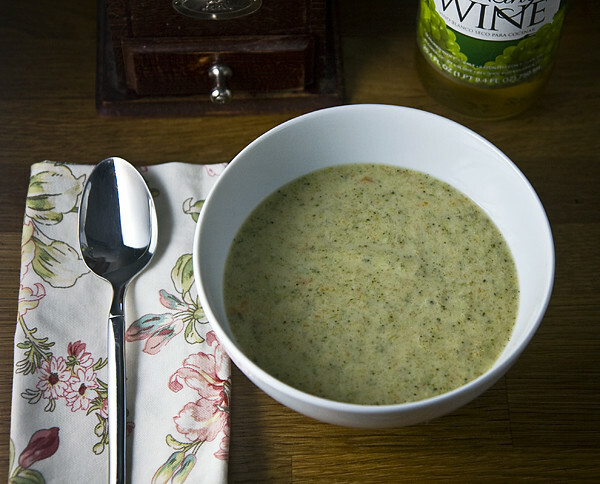 Broccoli soup is a classic that appeals to me, but there was no middle Pinterest ground between bland baby food-like puree and a coronary in a bowl, so I struck out on my own. On first whiff, Robert said it smelled like a soup he used to serve when he worked at a pub in England. But as he often says, “the proof is in the eating” and fortunately, the taste lived up to the aroma! Melt the butter over medium heat, add the onions and cook them until they’re translucent. Stir in the garlic and cook it for another minute or so, then add the flour. Reduce the heat to medium-low and cook and stir for 5 minutes or so… until the roux darkens a bit. Add the wine to deglaze the pan. Gradually whisk in the veggie stock, making sure to incorporate the roux, then whisk in the milk. Add everything except the creme fraiche and the cheese. Bring it to a boil, cover, reduce the heat and simmer it, stirring once in awhile for about 20 minutes, or until the broccoli is tender. Puree it to your favorite texture… I went for a full puree with an immersion blender. Temper in the creme fraiche, stir in the cheese and cook it until the cheese melts. I ended up with a bit more than two litres of soup… so good with garlic bread! I made this recipe for dinner tonight and it was a big hit! Love broccolli — wish I grew it better!